I wish it had a soundtrack but this is a brilliant archive film from the 1960's and 70's in Amsterdam, showing the lowest point in the city's proud cycling history. Copenhagen was on a parallel journey at the time so it even offers a Copenhagener insight into what this city was like after over a decade of urban planning revolving around the car. 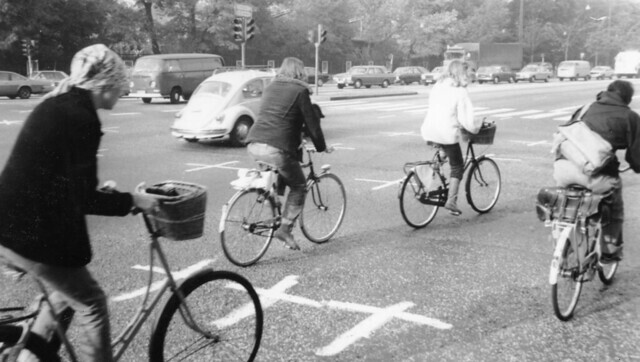 Images of the modern cycling cities of Amsterdam and Copenhagen are now freely available on the internet, so this film is an excellent way to see how bad it was when the car was given free reign as well as seeing the transformation from then to now. Narrow streets choked with cars now calmed with bicycle infrastructure and car-unfriendly intiatives that not only served to bring back the bicycles but also re-transformed the city into a liveable place. A place for people. Look at all those cars. I wonder where they went? "Yeah, but where do all the cars go?" is the latest desperate grasping at straws by the cycling Pamplonan boys who enjoy a brisk 'running with the bulls' and the accompanying rush of blood to their lycra shorts. Hating on bicycle infrastructure, fighting tooth and nail the promotion of cycling for regular citizens and now using 'where do we put the cars?!?!' as an excuse. I'm just about finished reading Jan Gehl's new book - Cities for People. Like his previous books, it's an important volume. Every page has a number of 'Aha!' moments. Such simple ideas that it boggles the mind that more cities are doing them. What I realised was that this is not a book for those who despise bicycle infrastructure. To them, automobile traffic is a necessity. It defines the way they like to ride bicycles. Removing the cars would take away their roller coaster. Shame for the few but fantastic for the other 99.9% of the population, as well for making our cities nicer places to live. Cities for People is a book for that 99.9%. Throughout the book, Gehl focuses on pedestrians but when bicycles are mentioned, they are placed alongside pedestrians. Which is, of course, how most people ride bicycles in cities - if given the chance. If we return to the film at the top... there were still people cycling in Amsterdam during the low period, just like in Copenhagen, as you can see in 'rush hour' clip, but the number of cyclists was dwindling. It took the massive grassroots protests of the 1970's and 1980's to force urban planners and politicians to return to planning for pedestrians and cyclists. 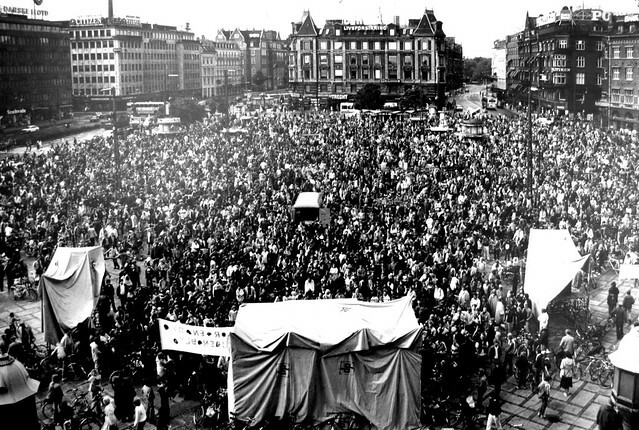 This is what it looked like in Copenhagen at a protest rally in the 1970's. Regular citizens in their thousands demonstrating for safer streets and the re-implementation of bicycle infrastructure. In order to draw attention to the need - and desire - for infrastructure white crosses were painted on the asphalt where cyclists had been killed. In the late 1960's there were roughly 300 hundred cyclists killed every year in Denmark. Last year, in 2010, there were 19. The power of the people triumphed. Cycle tracks are the Tahrir Square where Citizen Cyclists continue to gather to show that fighting for The Common Good can suceed and from where the dictators who only wish to serve the interests of the few are banished. 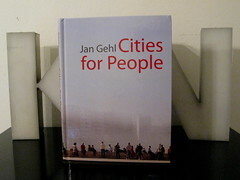 Jan Gehl's book Cities for People is published by Island Press. Reading it restores hope. It is rich with images and examples from around the world. "Biking simply becomes the way to get around town. Bicycle traffic changes gradually from being a small group of death-defying bicycle enthusiasts to being a wide popular movement comprising all age groups and layers of society from members of Parliament and mayors to pensioners and school children. "Bicycle traffic changes character dramatically in the process. When there are many bicycles and many children and seniors among them, the tempo is more stately and safe for all parties. Racing bicycles and Tour de France gear is replaced by more comfortable family bicycles and ordinary clothing. Cycling moves from being a sport and test of survival to being a practical way to get around town - for everyone. "This shift in culture from fast slalom bicycle trips between cars and many infringements of traffic regulations to a law-abiding stream of children, young people and seniors bicycling in a well-defined bicycle network has a big impact on society's perception of bicycle traffic as a genuine alternative and reasonable supplement to other forms of transport. The shift in culture also brings bicycles more in line with pedestrians and city life in general, and is one more reason that bicycles have a natural place in this book about city life." Isn't this the goal? Isn't this where we are headed. In many places, yes. Thanks to clever urban planners and visionary politicians. In far too many places, no. No thanks to the white noise of certain sub-cultures.